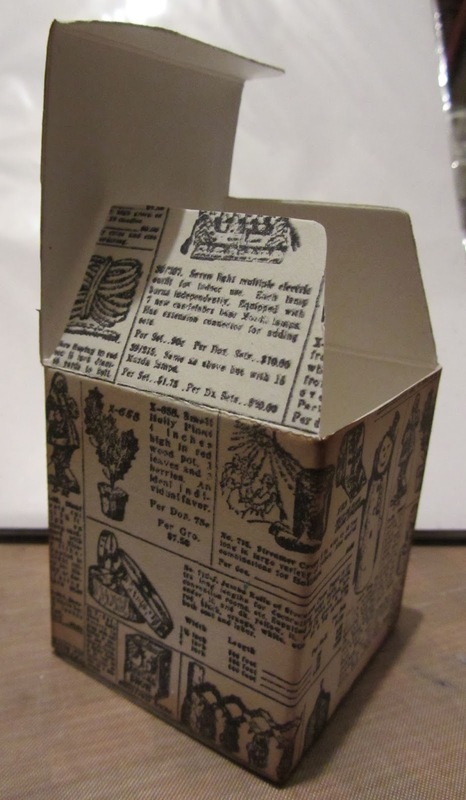 Eclectic Paperie: Extreme Recycling ! Good old tomato puree tubes. Once you've consumed the contents cut off the top and bottom, and cut up one side, open out the tube, rinse away any remaining tomato paste and smooth out the tube with the back of a wooden spoon. Trim away any jagged edges. The metal is pliable and easily cut with scissors and dies. 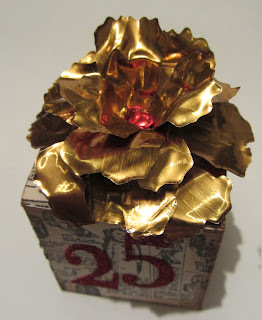 I used the Tattered Florals Die to create a festive flower embellishment. I haven't tried painting or colouring the metal as I just love the bright gold surface. Just be careful of sharp edges or while you are handling it. My gift box started life as a small cardboard box, the type that a jar of face cream comes in. Unfortunately I can't find the photos I took of this stage. Anyway, I carefully eased the glued part of the box apart and opened it out flat. 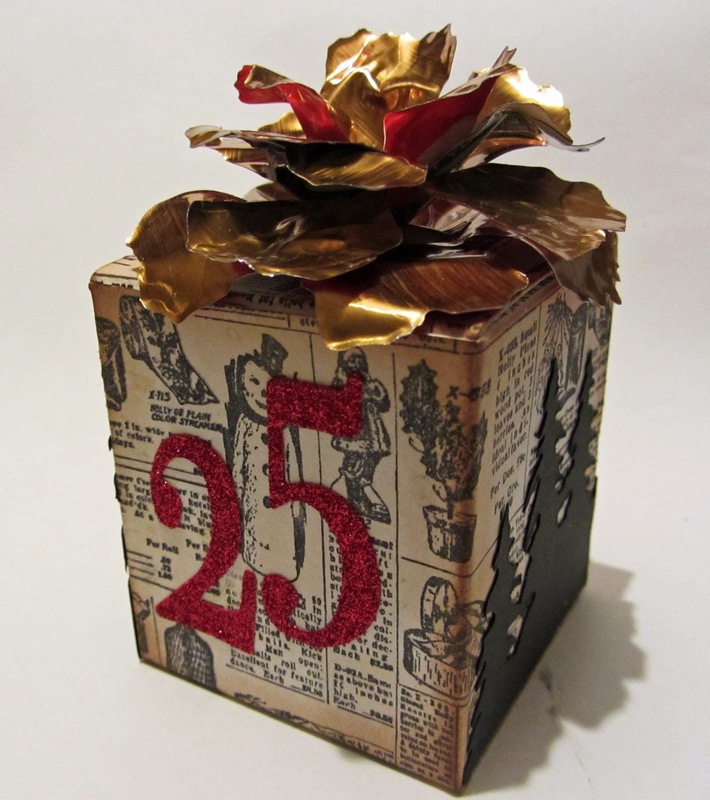 I then took a sheet of drawing paper, and stamped over the surface with Black Archival Ink using the Tim Holtz Seasonal Catalogue Christmas background stamp. I then positioned the box net, face down on the back of the stamped paper and adhered it with Studio Matte Medium. Once it was completely dry I trimmed the edges and folded the box together adhering the side with more Matte Medium. I blended a little Vintage Photo Distress ink along the edges for a more vintage look. I then set to with constructing the flower. I die cut three flower shapes and used scissors to cut one petal from one flower and two petals from another. There are quite a few tuorials on the internet which can better describe how to make these flowers, so I won't go into great depth here. I glued each layer of petals together using a hot glue gun. I then added a shiny brad to the centre before gluing the finished flower onto the lid of the box. Stunning flower with your extreme recycling, and very creative. WHAT! That is amazing!! Tomato Puree tubes . . . seriously the most creative idea of the year!! And such a beautiful project too!! LOVE! You don't know how many boxes I've altered-but I have been cutting each side and measuring & gluing. This idea of opening the box and doing it in one step is going to be a life saver! Puree tube-now that's the BEST recycle idea I've heard yet! This is FANTASTIC, Toni! LOVE how you covered the box and if I ever were to use puree in tubes, I would definitely try my hand at one of these FABULOUS flowers! LOVE this! I am amazed at how you thought of this. Gorgeous! Oh genius idea to use empty puree tubes. Absolutely awesome flowers and BEAUTIFUL box. Who knew that tomato puree tubes were so beautiful on the inside?! Well, you did, Toni! Gorgeous recycling, and I love the box too... but now I "need" those stamps - tempter!! Amazing, who would of thought to use an old tube! Very clever and the results are stunning.